Thank you for the insight into the colours. Unfortunately, I’m still stuck but I know I can’t go wrong with either colour. I think I will just choose the colour that best fits each piece rather than getting everything in just one colour. Great article! However, I’m still trying to decide between tan and otter green for my next Filson bag, a 256. The main reason is because I just haven’t seen an otter green bag in person. It tends to look bland and somewhat washed out in the online pictures. I currently have a tan 257 and a tan 246, however, I’ve been eyeing up a 256 for transporting my 13″ MacBook Pro to the office. It’s a casual environment so I could get away with either color, but I’m leaning towards the otter green because 1) It will have a better contrast to the color of my khakis that I wear and 2) It will make my Filson collection more balanced color-wise. Thanks, Justin. I agree with you that the pictures do not do justice to the Otter Green. In person, it is a darker and richer color. Since you already have a couple bags in tan, I would definitely recommend trying the 256 in Otter. The colors go very well together as part of a collection. I also wear a lot of khaki pants and find that I always reach for my Otter Green Filson pieces (in the winter) because they provide a nice contrast. As a bonus, they show dirt much less if you are frequently setting your bag on the ground. Go for the Otter…you will not be disappointed! Hi Charles, do u find the Tan color varies across the different models? I was at my local store today comparing the 232 and 256 and I notice that the 232 Tan comes in a lighter tone, more of yellowish as compared to 256 Tan looking in darker ‘brown’. Do u notice the same for your bags? Hi Daniel, thanks for your question. I have not seen much variation between the Tan across different models of the same age. However, there can definitely be some color differences when comparing bags of different ages. I purchased an OG briefcase that had been sitting in the store for almost 9 months and it had faded to a color slightly lighter than another bag I purchased the same day that was fresh from the factory. I think that these variances are a function of age (due to fading and perhaps also indicating different dye lots of fabric used at the factory), not necessarily by model. You may have seen two different bags made at different times, from slightly different bolts of fabric. With that being said, all of my Tan pieces are very consistent in color. Hope this helps. Great article! I have a couple of questions. I’m sort of new to the Filson thing, and I’m looking at purchasing some pieces soon, probably the padded computer bag, garment bag, and wheeled check-in bag (medium). I know everyone has their own opinions, but what is your opinion on mixing colors throughout your collection? I’m not really a fan of the brown, but I like the tan and the otter green. Is it “acceptable” to carry 2 pieces at once of different colors? I noticed that they don’t even make the wheeled check-in bag (medium) in tan…not sure why they don’t, but that pretty much means if I want that one, it’s definitely otter green. I just can’t decide which color to go with for the garment bag and the computer bag. I really like the tan because of the contrast, but it sounds like it will pickup stains easier. I also really like the otter green thought. I was a little concerned about the otter green after seeing a piece that was a little older and had faded, but it sounds like this is a normal thing and part of what you sign up for. Is there a way to keep it from fading, or is that part of the Filson aura? Final color recommendations for computer bag, garment bag, and wheeled check-in? Lastly, how do you feel about checking your Filson gear at an airport? It’s obviously super tough stuff, but it’s also expensive. Just curious on your thoughts about that. Thank you for your comment, Carson and welcome to the world of Filson. Back when I first started collecting Filson bags, I purchased all my pieces in Tan because I thought that it would make for a smart-looking matched set. After buying four pieces, I decided to change it up a bit and bought a Medium Travel Bag in Otter Green. Buying the second color was a revelation for me…because I LOVE the way the two colors work together. I actually now prefer to carry pieces of both colors at the same time. It is a more casual look, which I believe fits the style of the bag best. I have a fairly large collection and rarely ever leave the house with only one color. If you only like one color, then by all means just buy all of your pieces in that color. But if both colors appeal to you, then I highly recommend buying a couple of each. As far as traveling through airports, I tend to carry more Otter Green in situations where the bag is likely to get dirty or to be placed on the floor.. Other than that, they are very, very rugged and up to the task of airport travel. If, in the rare instance, something does happen, rest assured that Filson will take care of you to fix/replace the bag. I hope this helps and thanks for visiting the site! Thanks a lot Charles! Also, is there anything you recommend to put on the bag to preserve it? I was thinking I saw some product that Filson markets maybe to put on the fabric, but I’m not sure if that was what it was. Any thoughts? Thanks! The fabric is paraffin treated at the factory and is very good at resisting water, stains and dirt. All you need to do to clean it is brush it off or wipe it down with a slightly damp cloth. I would not recommend putting any other treatment on the bag. It will age and patina naturally and get better with age! Thanks a lot Charles! I look forward to visiting your site regularly! 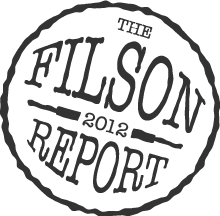 24 hours ago I hadn’t come across Filson, now I’m hooked after coming across your excellent work here – thanks! I’d imagine that if the brown/ navy darkened it would remain ‘smart’ but if it lightened then perhaps not? Maybe I’m overthinking it. Basically want to get the colour choice sorted as want to buy one 256 once and use it for a long time! I have looked through styleforum and there is a bit of debate on there but very hard to find pictures on google of an old battered one in brown, as most of the old ones seem to be tan…As navy is new there is limited old photos of those too. I appreciate your points on the contrasting design aesthetic, but I prefer to have something more monotone I think. 2) If your wardrobe has a lot of blue and grey tones, the Navy may be a bit more versatile because the handles will tie into browns/tans and the body of the bag will tie into blues/grays. The Brown bag will be the most traditional in appearance, whereas the blue will be a bit more youthful and slightly less formal. If you live in a colder climate, the brown will work a little better in the winter. I usually think of navy blue as a more nautical color that may work a little better in warmer climates. 3) The Navy twill does feel slightly thinner in person (even though Filson lists the stats as the same). At the end of the day, it really just comes down to personal preference. Between the two, I would choose the Navy, because it is more rare (in the wild) and because I like a little more contrast. Thanks Charles for the very informative and useful response! I’m going to let it lie for a few weeks before I decide and also visit the new store they have in Soho in London so I can see them in person as that will help also. Hoping to import from the US I think as I think the shop will quote the same price in the UK as in the US except in £ not $, so considerably more. I found the same with Tumi, they are extortionate over here, but I think I have grown out of them now… Cheers! What about black? Can I expect this to fade? If so I suppose there will be more contrast generated over time. Similarly with the tan bag, which as you’ve said should darken with time. I’m leaning towards black, just because it will match more other things. What are your thoughts on black? Thanks, and I’ll be watching your site! Thanks for visiting the site, Daniel. For whatever reason, the black Filson bags that I have owned in the past do not have the same tendency to fade over time. The color will change slightly, and they will be more likely to show dust, dog hair, pollen, etc. than the Tan. I, personally, love the way the classic tan patinas, darkens and ages over time. If you do a Google Image Search for “Filson Patina” you will see plenty of examples. I have a Otter Green 256 since yesterday and I really love a used vintage Look do you Think the Patina will also be cool for the Otter? How Long does it Take? Thanx for the answer! I am really hoping it goes quick 😉 maybe I am goingto get a Tote with zipper im tan soon!?! Is it True that there will be a refurbished vintage Collection by filson soon? I have heard that there are bags that have already Patina and filson did refurbished them and now they should come Out soon?!? First, many thanks for all your efforts you make in order to provide us with such thorough information! I am currently debating – once again – between tan, otter green and navy and would appreciate your opinion in that regard. My current collection includes an original briefcase in tan, a small duffle bag in tan, a computer briefcase in otter green and, last but not least, a medium duffle in otter green. Now, I would like to add a sportsman’s bag (also, but not only, used for carrying around fishing gear) and a medium travel bag and do not know yet which colour to choose. How would you decide? 1) Sportsman’s Bag: perhaps no other bag evokes the classic design of Filson than the Sportsman’s bag. It is such an iconic-looking piece with classic design cues; therefore, I find the bag looks best in Classic Tan. Not only because of the great contrast with the leather trim, but also because the bag is covered in zippers and I find the zippers to blend into the design better when the bag is tan. When this bag is in darker colors, like Otter Green, the zippers tend to dominate the aesthetic and (in my opinion) make it look less classic. So, for this bag…go with Classic Tan. 2) Medium Travel Bag (my favorite Filson piece!!! ): this is a large travel piece with very few visible external zippers, which means it will look good in pretty much any color. I tend to prefer darker colors for luggage and carry-ons because they are subjected to dirtier (and less predictable) conditions. I own this bag in both Classic Tan and Otter Green, but the green one is definitely my favorite. I would recommend the Otter Green for this bag (and then buy a nice 256 or 257 in the future to test out the Navy Blue). I hope this helps and be sure to send some pics when you make your decision…thanks! Many thanks for your prompt reply, your guidance and very interesting thoughts on that manner. I will follow your advice and take the Sportsman’s Bag in classic tan and the Medium Travel Bag in otter green. First – thanks for a great site. It’s been helpful in introducing me to Filson and especially in comparing the 256 and 257. Though I’m headed to grad school, I decided on the 256. I’ll be carrying mostly a MacBook Air and an iPad mini with maybe a book or two (but fortunately not textbooks). The only challenge here has been color. Navy has been my first choice. It seems more conservative and classy than it does rugged. If it really is a darker navy like user’s photos have shown then I think it is a good choice. Tan is tempting though. I mean… Damn that is a good-looking bag. Anyway, in a few years I plan to buy a nice leather briefcase (Lotuff zip-top in brown leather) after graduation and I want to make sure this Filson one is a good compliment. So – navy or tan? Thanks for the kind words, Chris! I am glad that you have found value in my reviews. 3) Most importantly, you said, “in a few years, I plan to buy a nice leather briefcase…after graduation”. That means that you have your “conservative” office briefcase covered and therefore, you can be a little more bold with your Filson briefcase. If you told me that the Filson would need to serve as your only briefcase after graduation, I may lean toward the Navy because it is certainly more conservative and would fit into more stodgy environments. However, if you will have a more formal leather briefcase to fall back on, then your Filson should be in Classic Tan! I hope this helps and stay tuned for more reviews in the near future. Hi, Charles. I’m a new Filson fan from Shanghai and have recently been hooked to the bolder American style delivered by Filson. I greatly appreciate your informative and excellent article regarding the color selection between the most classical and appealing Tan as well as Otter green. I would like your kind suggestions because I want to complete a look wearing my favorite Diesel Jacket and carrying my new love- Filson 258 in otter green. I have 2 diesel Jacket in black & olive green with appealing vintage and worn effect which goes very well with casual look. I also wears diesel jeans frequently both in my office and during leisure time. 1.Do you believe that Filson also goes well with leather and denims in addition to field jackets and khaki pants? 2.Which Jacket goes better with Otter green Filson brief case? Black or Olive green? 3.Do you think I should pick up more Filson models in different color to finish the look? Thanks for your comment! I am glad to hear you are enjoying your new Filson bag in Shaghai. Yes, I love the look of Filson bags with both leather and with denim and I use my Otter Green 256 all the time with khaki pants and denims of all colors. Perhaps consider either a 256/257 or a nice 261 zippered tote so that you not only have color variety, but you also have some functional variety in your collection. Many thanks for your constructive suggestions, Charles. Yeah, 256 is my first love with Filson and will never be the last. I will surely consider and decide which new Filson piece to pick up, in tan of course. That will make my look more versatile and completed. I think I don’t need to tell you that my new Filson bag already turned quite a few heads both in my office and parties with my friends. They all wanna know more about Filson and would love to pick up one for themselves. I already told them about Filson’s fantastic portal and its fine heritage and excellent workmanship. It’s something that you can’t resist or deny at the very first look of them. Thank you so much for visiting the blog and for the kind words! I am glad that I could help. Enjoy those bags and stay tuned! I’m currently looking at the briefcase computer bag as a gift for my boyfriend. He has mentioned Filson multiple times and I’m just beginning to research these bags for him and trying to figure out what color is best for his style. He works in a casual office environment (dark jeans and button downs), but I could also see him toting the briefcase along while wearing a nice blazer depending on his work day. I know for certain that he won’t wear black and navy together so that option is out for me. My question to you: which color do you think will be most versatile (be able to dress up somewhat, and dress down depending on the day). This will be his first Filson bag and I want this to be a good surprise for him! Any of your advice would be greatly appreciated! Thank you. You’ve a great site and a true gentleman in your advice! I’ve a tan small duffle and it has gained a great deal of patina and dirt. I use it almost daily as a gym bag and sometimes will carry it to work. I used to wear suits to work and now wear business casual…think navy chinos and either blue or black jackets in winter. I would like to get a second duffle (the size is perfect as a gym bag), as the tan is beginning to look too casual. I’ve leaned towards otter as its a dark color, but would appreciate your thoughts on the navy. if it’s worth saying, I don’t carry a briefcase or bag to work, but if I would need to, I’d get the navy 256. Thanks for the kind words, Mark! I would love to see some pics of that well-worn tan duffle. 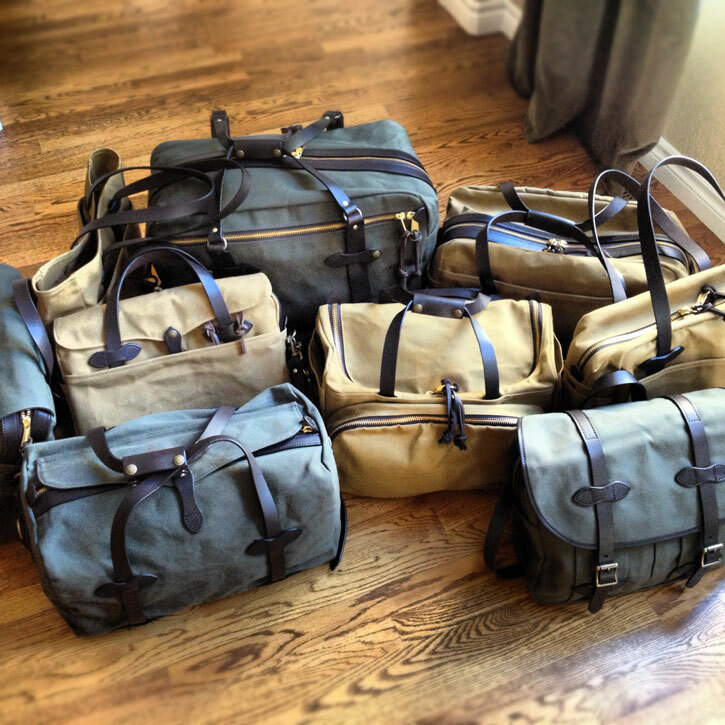 It is always nice to hear about someone getting great daily use from his Filson bags. In your situation I would probably lean toward the Navy, even though Otter Green is one of my all-time favorites. The Navy is easier to dress up or down and has a great year-round look to it. I also find the Navy ever so slightly less stiff than the tan or green which makes it a joy to use. The Navy 256 + Navy Duffel would be a killer pair and make a great combo for short weekend trips as well. Has anybody dyed a Filson bag? I’m wondering because I have an older green computer bag, and I was thinking on dying it black… I would be careful with the leather, of course. But I was wondering if anybody had any ideas? Thanks for the excellent article, but even after reading your post, I’m still divided between the tan and otter green. After purchasing a Red Wing 875 Classic Moc Toe, I came to know about Filson. The 257 is exactly the kind of a versatile briefcase that I was looking for. Taking clues from your post, I feel that I should go for the green. The one thing that I do not like with the green is the fading away of the color. Is there a way that I could retain the color by waxing, polishing or whatever means? Have you got any thoughts on it? Congratulations on your decision to buy the 257…it is a great bag! You have to congratulate me again as I took the plunge and bought the 257 in Otter Green. My initial impression of the bag is that it is relatively big and looks like it can take tons of stuff in it. I hope this lasts for ever! I thank you for your wonderful website and I will be hooked to your blogs from now on! I’m enjoying carrying my 257 around to office everyday. I stack up food, coffee, water, mac book pro and a charger, a 200 paged A4 sized diary, a 500 page text book. The bag has no issues with the load. It just looks awesome! I’m slowly breaking it in. I’m looking to purchase a black medium duffel bag. Back in June 2013, you replied to another poster about black bags. In that post, you stated that your black pieces hadn’t faded like the otter green color. How have they aged over the last few years? Has the black faded/what does the patina look like? Thanks in advance! Thanks for your question…I sold off the black bags that I had (as testers) so I was not able to assess the long term durability and fading of that particular color. I am sorry I couldn’t be of more help! Hello Charles, Great blog and article. I’m about to purchase 70140 (the 24 hours) as my everyday bag to go to work but also as a “personal item” when traveling. I’m even thinking that for a 2 days trip it could be my only bag if I travel with my suit. My usage of this bag will be to carry my laptop, tablet, notebooks, pens, hard drive, couple of books and a very light toiletry on a daily basis. I work in an office environment in France but nobody wears suit. I wear chinos / pants and shirt. I’d like to be able to use this bag both with a suit (or pants / jacket) when visiting clients, for day to day use, and for personal use as well with jeans so I’m looking for something not that easy to find (full black leather bags are too formal for my style). – would the 70140 fit my needs (I believe it will but would love to hear your take on this). – Which colour would you advise I should take ? Thanks for taking the time to write this wonderfully helpful post. Like many, I originally eyed tan, but have since developed concerns that tan would reflect dirt and become unusable in any professional settings. My backup colors would be brown (for the computer bag) and blue (for the duffle). Your thoughts would be most appreciated. Thanks for your comment…I have not owned many of the newer Navy and Brown bags, but have carried them from time to time. Otter Green is still my favorite Filson color. I like the way it gently fades with age and the way it tends to hide dirt better than the tan. I also really like the tan, but have fewer tan pieces because I find myself always reaching for the Otter Green. It really comes down to personal preference and your preferred design aesthetic. There are no wrong choices. I hope this helps! I work in I.T. I’m looking for a laptop bag that can hold my laptop, iPad, some cables and everyday necessities like umbrella, glasses, etc. I’m torn between the Filson 24 hour bag and the 256/257. I’m also torn what color. I live in NY, ride the train as my daily commute and work in a firm environment where dress code is business casual. It all depends on what material you are looking for. The 256 is made of the super heavy weight 22 oz twill and will wear differently than the 24-Hour briefcase which is made of a much lighter and “floppier” tin cloth. I really enjoy both bags, but find that the tin cloth has a more casual look because it shows “character” marks very quickly and has less structure. If you need a more structured choice for a business environment…go with the 256. I hope this helps…sorry for the late reply. Hello: I’m a college senior set to graduate in a month, and after a lot of research, I’m heavily leaning toward a black Filson 256 briefcase to purchase as I enter the professional world. I know black isn’t as popular as the tan or olive color schemes and certainly not as ubiquitous, but is the black canvas (with the matching black leather accents) still an appropriate choice of color for the traditional 256? Or is it frowned upon? Does it mesh okay with the heritage style of a Filson bag? Will it look unattractive/stupid? Am I overthinking this? Advice would be much appreciated. Thanks for your question, Jack and congratulations on your impending graduation. As far as the color is concerned, I am a firm believer in matching the color to the aesthetic of the brand. I also think that what makes Filson bags so unique is the beautiful contrast between the bridle leather and the canvas. For those two reasons, I would stick with the Tan or the Otter Green for your 256, especially if it will be your first/only Filson bag. Later, you can build your collection by trying some of the more non-traditional colors, i.e., Black, Navy, etc. At the end of the day, you will have a great bag no matter what, but the Tan and Otter Green are true classics and that is the direction I would lean. I hope this helps!